Fishing clear creeks to dirty ditches and everything in between. I was off of work a bit early so Luis and I decided to hit the bee hive. The weather in Cali right now is perfect. It was in the high 70's today (Friday) in Woodland; perfect for fishing. We got to the bee hive at around 3:00. We had night crawlers and mini crawlers and were after some crappie! I figured we had so much success on wednesday that maybe they would be popping at the hive. Well, the crappie were not biting, nor were the bluegill nor the green sunfish. The water was very high and the banks were muddy. both of us slipped and fell at least a couple times each. There were tons of minnows all over in the water being very active. we were able to catch a few and hoped the crappie would gobble them up, but they weren't into them either. At one point we saw the game warden walking around on the other side of the slough. In all the years going there I had NEVER seen a game warden but there is a first time for everything. I waved at him and he waved back but kept walking. within a few minutes He decided to walk back and sure enough he paid us a visit. Seemed like a nice guy which is cool because sometimes they can be total punks! As you can hear, this cat peeled some line! I had my drag set kind of tight but when I saw my rod double over, I released the drag a bit. When I first hooked into it I thought it was a carp for sure. This thing didn't just peel line, it made my rod sing! It ran from one end to another and headed for a tree clear on the other side of where I was fishing. I was able to play it until it got tired. Since it was muddy and the water was high, I decided it would be best to net my own fish. This 4 lber is the biggest catfish I have caught to date and it was definitely a blast to catch! This is why I love this spot. Just another bee at the hive, my friends! Hey Bill, I do fish for trout but the closest trout lake for me is an hour away. Since I live in the valley, if I am jonesing for fish and its already later in the day, I usually head to nearby fishing holes and those are all warm water holes. Nice Cat. A 4 pounder will surely give you a run for your money. Thanks. It sure did. had a blast catching it. For your next challenge, you have to catch one on the fly. I've only done it a few times, but it can be done. Challenge accepted! 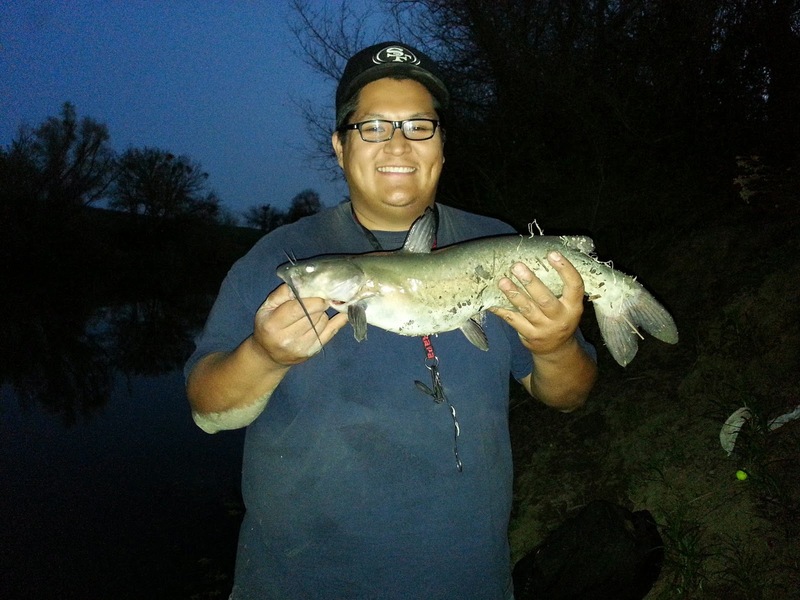 Would you use a sinking line to catch cats on the fly? I agree with Jay. They are fun anytime, but, when you hook Mr. Whiskers on a fly that is quite the battle! That is a battle in which I would love to engage!! You're doing much better than I have this year. Keep it up. thanks Daniel, I will keep trying hard! This site is dedicated to those good ol’ bank fishermen hitting the water every weekend looking to catch every fish possible from shore. Break That Bank Folks!! 7/1/15 - 10 more fish and I'll hit 200 for the year! *= Type of fish I haven't caught YET! Is the Ice Fishing Season Over?